BetOnline Poker opened up their online platform in 1998 and they have worked hard to earn their good reputation in the online gambling industry. Opening their doors to US players and having Mac friendly software has helped them to fill the gaps in the US market that some other rooms leave behind. Today, BetOnline poker is an established brand that all online poker players should know about and their soft traffic offers some genuinely interesting opportunities. BetOnline has had a thriving customer base since 1991, and have been accepting bets long before they made their presence online. They have been rapidly gaining popularity which has been greatly boosting their traffic numbers and now that they are aligned with the Chico Poker Network, they have more than enough traffic to go around. Their Hold'em tables are by far their most popular, but players never have to look hard for a table or tournament they will enjoy as there are plenty of tables and cash games open 24/7. As is the same with many poker rooms that house sports books, there is quite a large population of poorly skilled poker players. BetOnline is not the place to play if you're looking to find tough competition or professional level play. The majority of players here are casual players, many brought over by the site's sportsbetting and casino operations. Players who enjoy playing for fun or playing against fish and sometimes outright terrible players - can easily build up a great bankroll here, and have fun doing it. 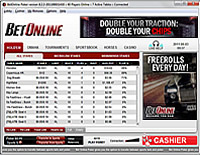 BetOnline's poker software is simple and fun to use, with attractive graphics that make playing here an enjoyable experience. 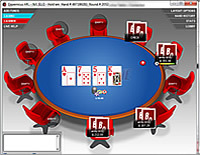 Multi-tabling is supported, and there are a number of different tools to make game play more convenient. There are all the usual statistics tools including hands history, notepad, and customizable table sizes. The software is stable and secure, and even during peak times there is little or no lag, assuming that you have a stable internet connection. The best part of BetOnline's software is probably just the fact that it is totally cross-platform compatible. This allows Mac players to enjoy all the benefits of downloaded software instead of relying on flash platforms that don't offer the same tools, games, and benefits as the full version. Download the BetOnline Poker package today to see for yourself! BetOnline Poker has a number of great bonuses spread across all of the offerings on their site, so it is important for players to regularly check their promotions page to ensure they are taking advantage of every opportunity. Remember, new promotions are released regularly, some focused on different sections of their site (the sportsbook or casino, for example). The best poker promotion that BetOnline offers right now is their lifetime bonus. Instead of getting a big bonus code to use every now and then, BetOnline will simply give you 25% on every deposit over $50 (and up to $900), so there is no need to wait for special emails or hunt down bonus codes. BetOnline has a good FAQ section that acts as a starting point for players looking for answers. And while it is not as in depth as those found on other sites, everything is very clearly organized and understandable. However if players cannot find their answers there, they can reach the customer support staff by email, Skype, their live chat client, or telephone. BetOnline also offers horse race betting and sports betting, so it stands to reason their phone staff is top notch. Knowledgeable, polite, and efficient, BetOnline's support staff will do their best to answer all questions and resolve all concerns to ensure you have an enjoyable experience.